Jaekel, T. A high price for cheap electronics. GREAT Insights Magazine, Volume 6, Issue 3. July/August 2017. Though an important step in the right direction, the accompanying measures to the EU Regulation on the responsible sourcing of minerals from conflict affected and high-risk areas risk failing to adequately tackle challenges on the ground in source countries. Minerals and metals such as tin, tantalum, tungsten and gold (3TGs) are used for vital components in everyday products such as laptops, mobile phones and cars. These minerals, and many others, are to a large extent mined in conflict-affected or high-risk areas such as Afghanistan, the Central African Republic (CAR), Colombia, the Democratic Republic of Congo (DRC), and Myanmar. In many cases, armed groups control the extraction and trade of minerals in order to finance their operations. This illicit trade contributes to violent conflicts and severe human rights violations. The above-mentioned minerals have therefore been classified as ‘conflict minerals’. The conflict in the DRC has claimed the lives of millions, many from disease and starvation, and approximately 2.8 million people remain internally displaced and some 450,000 have become refugees. Preventing illicit trade of conflict minerals is a necessary step in preventing continued human rights violations. In December 2015, when negotiations on the European Union (EU) Regulation on the responsible sourcing of minerals from conflict affected and high-risk areas were still ongoing, I was part of a research team that went to eastern DRC in order to better understand challenges and needs of the people most affected by the extractive industry in the country. This article tells that story. Both the North and South Kivu provinces in eastern DRC are mineral-rich regions where 3TGs are mined extensively. The mining sector relies heavily on artisanal mining. Approximately 80–90% of mining activities in the region are small-scale, and 500,000–2 million workers are engaged in the sector. The industry generates an economy vital to local communities, as the miners provide income for between 2.5–9 million people. A well-functioning and legal artisanal mining sector is therefore vital for the development of the country. Dr. Nene Morisho at Pole Institute explained, during a visit to the organisations offices in Goma, North Kivu, that the suspension of artisanal mining, enacted by the Congolese government in 2010, hit the industry hard and had serious socio-economic effects. Many labourers suddenly lost their income and were therefore unable to support their families. School dropout rates went up and robberies increased in the region. Furthermore, the amount of minerals smuggled and illegally traded increased. The suspension was counterproductive and had to be lifted after six months. Currently, under Congolese law, only minerals from validated so-called ‘green mines’ can be legally traded. When local authorities have surveyed a mine and classified it as green, a bag-and-tag system is put in place in order to trace the minerals from mine to export. Each link in the chain – the miners, the local agents and the traders – carefully weigh the bags of minerals, and are then provided with a tag from the validation authority. The tag contains a barcode, which in turn is validated by the next link in the supply chain. So far there is no tractability system for gold, only for 3T minerals. Safanto Bulongo, the civil society representative of the provisional authorisation committee in South Kivu, explained during a meeting in Bukavu that the problem with the bag-and-tag system is that at each stage, the bags are reopened in order to check the quality of the minerals and a new tag is applied. Consequently, at each stage of the chain, there is a risk of minerals from non-validated sites getting mixed in with legal minerals. Also, because of widespread corruption, buying a validated tag from the local authorities has become common practice. Maître Bundibulya, Legal Counsel to the Minister of Mines in South Kivu and Chair of the provisional authorisation committee, moreover emphasised the lack of capacity of the local authorities, such as the committee itself. Due to insufficient funding the committee had, at the time, validated only 46 out of approximately 900 mines in the province. Even though the new tagging system is a welcome improvement by the industry, the challenges mentioned by both Mr Bulongo and Mr Bundibulya were also echoed by Basimine Dieudone, President of the Bukavu Traders’ Association. The association buys minerals from local traders and sells them for export. Mr Dieudone confirmed that agents and traders mix illegal minerals with legal, and stressed that the 46 validated mines cannot meet the demand. During the trip to the DRC our research team also visited several mining sites in both Kivu provinces. The mines are located in remote areas in the countryside and getting there requires hours of driving on narrow dirt roads, which have a tendency to collapse due to landslides and heavy rain. The last parts of the roads are often accessible only on foot. Depending on the mineral mined at the specific location, the mines can both take the form of open pit mining or narrow shafts in the mountainside up to ten meters deep, where ore is extracted. The number of artisanal miners at the sites also varied, from up to 6,000 at peak season at one of the mines to 10-15 at another. Due to mostly manual labour, work-related injuries such as broken fingers and blast-related injuries are common. Digging for ore in the narrow shafts is even more dangerous due to the shafts barely fitting one worker at a time and heavy rocks being supported only by flimsy pieces of wood. Cave-ins are a common cause for injuries and even death. The heavy work takes its toll on the labourers. Several of the interviewed miners told of difficult conditions and that the body can only take about ten years in the mine. The workers therefore are heavily dependent on their children eventually taking up work in the mines in order to be able to support the parents when the body cannot manage the heavy manual work anymore. Moreover, besides work-related issues, the presence of armed groups is a severe safety risk for the mine workers. Remote mining sites are prone to attacks and extortion by armed forces. Both rebel groups and the Congolese military intimidate miners. The interviewed miners often faced extortion from armed groups, demanding food, bribes or everything the workers had mined that day. Local mining company officials, who chose to remain anonymous due to safety reasons, emphasised that the companies themselves cannot put a stop to the presence of armed groups at the mining sites. It is simply too dangerous. Another challenge for the mining companies is smugglers. The company officials estimated that around 30% of the minerals mined at the sites are smuggled by artisanal miners across the border to Rwanda, and later sold as Rwandan origin, in order to receive a better price. The challenges in the mining sector in the DRC are widespread and complex. Dealing with the many issues requires a comprehensive approach and all actors in the supply chain to take responsibility. NGOs and experts have at several occasions pointed out severe flaws in the EU Regulation itself, such as only covering a fraction of the imports of minerals by only requiring upstream companies to conduct due diligence, the counterproductive proposed indicative list of conflict-affected and high-risk areas, risks of the White List leading to whitewashing of a considerable number of companies where due diligence practices are not at all or not adequately evaluated, and too high annual thresholds for exemption from the due diligence requirements. As these issues have been comprehensively debated, this article rather highlights gaps in the proposed accompanying measures to the Regulation. In order to prevent illicit trade of conflict minerals more is needed than the weak Regulation, and this is where the accompanying measures play an important role. Even though the proposed measures are a welcome complement to the Regulation, there are several issues that need strengthening and clarification in order to effectively deal with the complex challenges on the ground. One of the main challenges identified is widespread corruption in the DRC and therefore a lack of reliability of the tagging system in place. Moreover, the lack of traceability systems for gold makes it even more difficult to determine the origin. The accompanying measures should therefore include a clear commitment to combating corruption and mining fraud, strengthening capacity of local authorities, establishment of alternative traceability systems for 3Ts and a system for gold. Furthermore, the importance of the artisanal mining sector needs increased focus in the accompanying measures by supporting the formalisation of the sector, securing its coexistence with the industrial mining sector. Artisanal mining sites also need support in the process of certification in order to meet due diligence standards. A crucial issue is to properly involve local actors. The accompanying measures adopt to a large extent a top-down approach working through the OECD, International Conference of the Great Lakes Region, United Nations agencies and the central government. Non-state actors such as mining cooperatives and civil society have real expertise in the artisanal mining sector and need support in their advocacy and training work. These are just a few of the crucial issues that need to be addressed in order to meet ambitions and stem the illicit trade of conflict minerals. Due to the mentioned flaws in the Regulation itself, the accompanying measures become an even more crucial instrument to enact real change on the ground. If the EU fails in this regard the mine workers will continuously be the ones paying the price for cheap electronics. Théo Jaekel is Senior Specialist: Human Rights and Supply Chain, Vinge Law Firm. 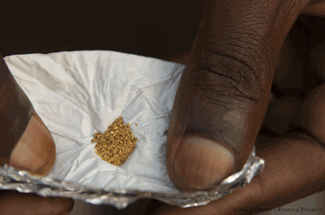 Photo: Gold from eastern Congo. Credits: Enough Project via Flickr.